Ready-to-use indoor &amp; outdoor insect killer Fast acting - kills ants &amp; roaches in seconds Creates barrier to keep bugs out Controls 60+ different pests Low-odor, non-staining water-based formula Bayer active ingredient: 0.05% B-Cyfluthrin. Permethrin .25 percent; Fast acting and long lasting (up to four weeks) control of ants, fleas, ticks, chinch bugs, crickets and more. Excellent product for household perimeter treatment applications and more. Not for sale in AL, FL, GA, IL, IN, KY, LA, MS, NC, OH, SC, VA, and WV. Triple action (.1 percent Tetramethrin plus .25 percent Permethrin plus .5 percent Piperonyl Butoxide formula) provides instant knock down, quick kill and residual action that takes out the entire nest and prevents re-nesting. Jet spray shoots 20 ft. Oil based. No CFCs. Dielectric breakdown (non-conductive up to 47, 300 volts). Not for sale in AL, FL, GA, IL, IN, KY, LA, MS, NC, OH, SC, VA and WV. 2-in-1 formula controls insects while feeding your plants. One application lasts up to 8 weeks. 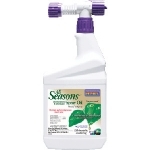 Kills and controls Aphids, Whiteflies, Scales, Thrips and other insects. No spraying. No mess. Free applicator inserts spike so you never have to touch the spike or the soil. Use on potted indoor or outdoor ornamental plants. Bayer active - 2.5% Imidacloprid. Analysis - 8-11-5 slow release fertilizer. This product controls Insects, diseases and mites up to 30 days. Kills insects on contact. Highly effective against mites. Cures and prevents diseases. For Roses, Flowers, Shrubs and Trees. Not for sale in NY. Now, there s an RTU that controls Insects, diseases and mites. 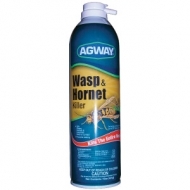 Kills broad spectrum of insects on contact. Provides systemic control of wide range of pests. Cures and prevents diseases. Highly effective against mites including spider mites Last up to 4 weeks. Not for sale in NY. New RTS formula, no measuring. No mixing. Exclusive formula. Three garden products in one. Kills insects on contact. Cures and prevents diseases. Highly effective against Spider Mites. 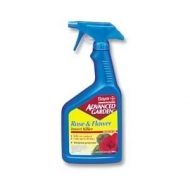 For use on roses, flowers, trees and shrubs. Up to 30-day rainproof protection. Actives - Midacloprid, Tebuconazole Tau-Fluvalinate. Not for sale in NY. 3 Systemic Products in One - Insect control, disease control and fertilizer. Six-weeks insect and disease protection. No spraying! Just mix with water and pour around base of plant. Bayer actives - 0.15% MERIT insecticide, 0.80% Tebuconazole, 9-14-9 fertilizer. Not for sale in NY. 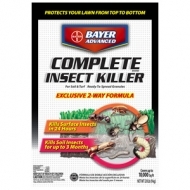 Exclusive combination of Bayer proprietary ingredients, 0.15 percent Imidacloprid and 0.05 percent Beta-cyfluthrin, which provides 2-way action for maximum insect control. Two Weed Problems One Simple Solution. The only family of selective turf herbicides that kills both broadleaf and grassy weeds in one easy step. Something neither Weed-B-Gon, Max nor Spectracide Weed Stop 2X can claim. Kills all the problem lawn weeds - Crabgrass, Dandelions and Clover. Plus kills over 200 additional weeds. Wont harm lawns. Not for sale in FL. Exclusive two-way formula controls both surface and soil insects. Kills surface insects in 24 hours. Kills soil insects for up to 3 months. Kills the most common lawn pests, including: Ants, Fleas, Ticks, European Crane Fly Larvae, Grubs, Mole Crickets and more. The only product that combines two targeted chemistries in one product to achieve true maximum protection from insects that attack from above the ground and the ones that attack from below. Fast acting formula works 2 ways for powerful insect control. Kills insects both above and below ground. Long-lasting - up to 90-day subsurface insect protection. Not for sale in Long Island NY. A targeted, high performance solution. Cures and prevents diseases that harm trees, shrubs, roses, flowers, and houseplants. The Bayer Advanced Snail and Slug Killer contains 1% Iron Phosphate. May be used around pets and wildlife. Baits and kills snails and slugs immediately! 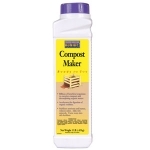 Use around flowers, gardens, and fruit trees. 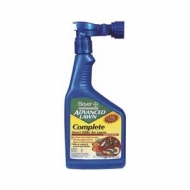 The 1 gallon Bayer Advanced Home Pest Control eliminates ants and roaches. It&#39;s water-based formula has low odor and is non-staining. 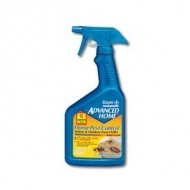 Unique dual action formula kills common pests in seconds PLUS reduces 99% of the germs they may leave behind. Provides up to 12 months of indoor protection. Kills over 60 pests 2X more than leading competitors. Creates a barrier that keeps bugs and germs out of your home. Kills hidden bugs, nested sprayer is easy to spray and store. Active ingredients - 0.05% -Cyfluthrin, 0.30% Sodium O-phenylphenate. The Bayer Advanced Carpenter Ant and Termite control contains 0.02% Deltamethrin and lasts for up to 4 months with one application! Product is easy to use with new Bayer Advanced Battery Operated Sprayer. Kills on contact! Kills ants, fleas, ticks, crickets, spiders, flies and other listed pests! Effectively control the following insect pests on roses, flowers, trees and shrubs: Adelgids, Aphids, Bagworms, Boxelder Bugs, Clover Mites, Elm Leaf Beetles, Grasshoppers, Gypsy Moth Larvae, Japanese Beetles (adult), Lacebugs, Leaf-feeding Beetles, Leaf-feeding Caterpillars, Leafminers, Mealybugs, Mosquitoes, Pillbugs, Sawfly Larvae, Scale Insects (crawler stages), Spittlebugs, Thrips and Whiteflies. Creating a termite killing zone has never been easier. Treat the entire perimeter of home in minutes. No digging, no trenching, no drilling, no staking. Just sprinkle granules around perimeter of home and water in. Stops termite feeding. Kills termites in one application. Not for sale in NY. A superior type parafinic oil that may be used as a growing season spray, dormant spray (no leaves) or delayed dormant (green tip) spray to control overwintering eggs of red spiders, scale insects, aphids, bud moths, leaf roller, red bug, codling moth, blister mites, galls, whitefly, mealy bugs and other insects. Highly recommended for use on fruit trees, shade trees, shrubs, ornamentals, roses and vegetables. Safe and pleasant to use. Readily mixes with water for spraying. Will not stain. Insecticide, Ready-to-Use; Our superior parafinic oil in convenient, RTU form kills all stages of insects on listed fruit, flowers, houseplants, vegetables. Not a chemical insecticide. Works by smothering. No potential for resistance. One application kills insects and prevents new infestations for the entire year. No spraying, just mix and pour at base of the plant.